I can bet that if you heard the name of ‘Boeing’ the next thing on your mind is Airplane. I am not saying anything else. But is doesn’t mean Boeing can’t make other things like Smartphone! 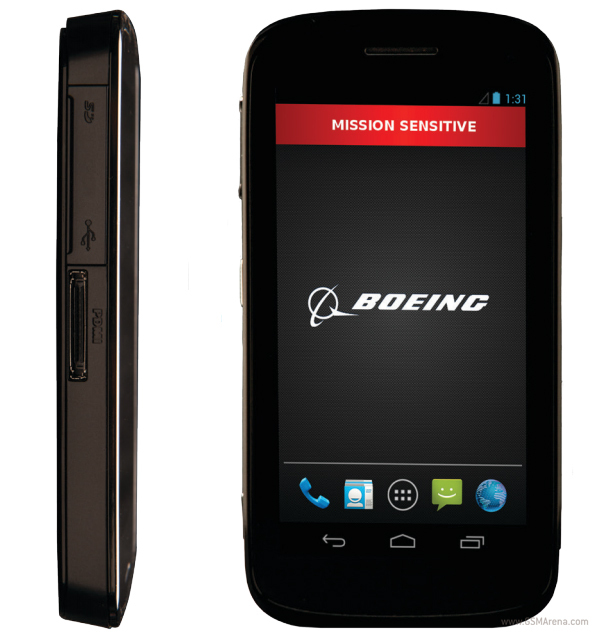 They announced a new Android smartphone called the Boeing Black with security and modular design in mind. The hardware and the software on the phone is built from the grounds up for securely storing and transmitting data especially for the US defence and security community. As like any other security centric device Boeing Black has all the techniques like disk encryption, hardware root of trust, hardware crpto engine, embedded secure components, trusted platform modules and secure boot to safeguard your data. The phone will even go as far as to delete the data if it detects some is trying to break open the casing of the device. That’s not all in Boeing Black’s feature list. The design is also modular to some extent, so you can remove the back cover and attach various modules such as extended battery, satellite transceivers, advanced location tracking sensors, etc. On the specification side, the Boeing Black has a 4.3-inch, qHD display, 1.2GHz dual-core ARM Cortex-A9 CPU, microSD card slot, dual SIM support, Bluetooth v2.1 + EDR, 1590mAh battery and an unspecified version of Android. No pricing or availability details have been revealed, yet. Its safe to assume that this phone will not be available for mass people. Only people working for US fovt can except this kind of thing. But don’t worry, Blackphone is coming for you very soon.